I'm sure that the story is old, but the OHSAA's action is not. They ruled that Strongsville did not "intentionally" play 12 girls in the state semifinal game last year vs Twinsburg. Even though they were caught in another game previously using 12 girls. What? STATE SEMI-FINALS??? What are we teaching our kids??? 2) I am a parent. But that's where the correctness of your assumptions end. 3) It's been years since I've seen a girls soccer game (Sorry). 4) I've never seen a Twinsburg girls soccer game. 5) You can't find another post of mine referring to Twinsburg. 6) However, I was fortunate to have seen Medina boys soccer this year. Wow! The frenzied pace at which the play the game is mind-boggling! But that's off topic. 7) I never heard of this "12 player" situation until I saw the ohio.com article about the OHSAA's ruling on the day that I posted it. 8) I would assume that his topic was bandied about on this forum back in the fall, but I didn't even know about the situation so I'm late to the party. If I was a Twinsburg parent, I would have posted back then. 9) But if you want to call me a Twinsburg parent to belittle my statement, please feel free. Here are my random thoughts. 1) With all the soccer I've watched, I've never seen another incident where a team had 12 players on the field. I've not even heard of it. Let alone the same team twice. And in the state semi-final?? 2) It's hard to imagine HOW someone can inadvertently sub a 12th person into the game. The substitution procedure is a rather formal process. It's not like hockey where folks sub on the fly. And it's not like basketball where a team can break a huddle and accidentally have a 6th guy on the floor due to a non-communication between players subbing. So you'd almost have to do 12 players on purpose. I assume there's video on how it happened, but I'm not aware of the discussion of the video. 3) As infrequent as "12 players" is, the fact that the same team was reported TWICE?? Seriously?? How many OTHER teams have ever been reported? If you pick up pack of gum at the store and stick it in your pocket and get caught, you might say, "oh, it was an accident, I meant to pay for it, I stuck it in there when I was shopping for other stuff..."
If you get caught a second time, not only am I not buying the accident story, I'm now convinced that you've done it many more times where you weren't caught. If you get caught cheating on a test a couple times, how many times have you NOT been caught? 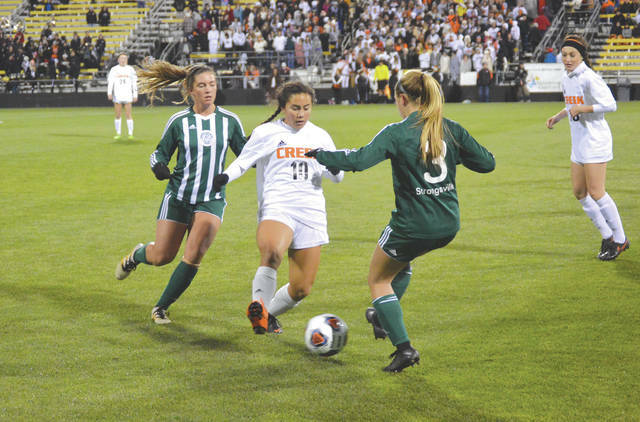 It would be interesting to get access to a year's worth of Strongsville girls' soccer's close games and just see if it's happened where it wasn't caught. The irony is that this ohio.com story seems like the OHSAA was WAY more concerned about the officials rather than the perpetrators. Obviously the Strongsville team was a great team. Why would they need to resort to this? Why resort to this ... it's Northern Ohio soccer. I played in the men's league up there 35 years ago and the disregard for rules was really bad back then. OMG THAT IS SO FREAKING CLEVER!!! HILARIOUS!!! I CANT STOP LAUGHING AT HOW FUNNY YOU ARE!!! OMG OMG OMG eh. Huh. You just made his point. Well played. I am still laughing; anyone else notice that Jed is extremely opinion about HS soccer in Ohio. Listen to his radio show, it is quite entertaining, he loves to call out coaches, clubs, and HS programs; which, in fairness, is his prerogative. He frequents this site and trolls the posts looking for something to degrade. BUT, if you call him out, oh my!! Anyone, Jed included, can sit behind a computer screen and have an opinion. Let's try and make a difference and help, not by ridiculing or degrading, but educating. Coach a team, then you may have a better sense of what coaches go thru; attend a youth game and listen to some parents! I am curious to find out, truly, how many people that post on this forum actually meet that criteria. Coach a team??? HAHAHAHAHA. Ummmm, I did for 14+ years. LOSER, MYOPIC PARENTS have ruined that for hundreds of quality coaches across Ohio alone that I know well, and with the helicopter, snowplow level MOST parents have become + the ENTITLEMENT most kids demand, I would rather shove a fork into both of my eyeballs than even CONSIDER every getting back into that HELL. But thanks for the suggestion. Oh, and as for radio- its called sarcasm. And a role I play just like getting under the skin of idiots on here. Good lord figure it out. Its NOT rocket science. And a role I play just like getting under the skin of idiots on here. Good lord figure it out. Its NOT rocket science. But, Jed, these are elementary school retorts at best. If you're going to employ tactics to "get under one's skin," try raising the IQ of those tactics. Please reply with one of your all caps childish rants. I'll reply with "I am rubber, you are glue," just to play along. I also wonder how Strongsville made it to the state finals without being called out for illegal jerseys. No numbers on the front. Are you advocating ignoring all OHSAA rules, or just some of them? There are reasons for jersey numbers to be on the front and back. I don't think Strongsville's illegal jerseys has been mentioned on Yappi before, so it is not a rehash. Personally, I was surprised that top notch program like that would make such a mistake. Must be a slow soccer month if this is the main topic here..
Why shouldn't they be more concerned about the officials? The officials are responsible for substitution. It happened under their watch. I remember the conversation from the fall. I believe it happened during a "normal" substitution and the refs lost track of who was coming on and going off. It was a human error. An unfortunate one but still one. I haven't seen the video in months, but my memory is that an odd situation occurred due to Strongsville's goalie getting injured. She was immediately faced with a couple of tough saves, which she saved (maybe with rebounds), and there was a lot of excitement. It was an emotional moment when she was subbed back out only a few minutes after coming in, and that's when (going by memory) two people -- one being the starting goalie -- came on, but only the substitute goalie came off. Obviously, this never should have happened, especially with an extra substitution official. And Strongsville probably should have been aware of the situation earlier than they were. But I've run across this situation here and there through the years. It almost always occurs when something unusual happens. I've never seen someone do it intentionally. We can pick up on it more now because there's far more video available (and even with video, it often goes undetected). Very unfortunate incident. SO, according to your evaluation, placement of the captain's bands and playing with an additional player is the SAME!! You must be a Strongsville supporter. Also, jersey tucked in as a rule has been done for about 6 years. footy sorry i missed the shirt rule been a few years. SAME? oh heck no, but let me ask you this, which rules SHOULD they enforce? That was my point, things get missed i doubt it was intentional. and yep i am an avid strongsville booster, go hornets!!!!! Enforce the rules that directly effect the game; which is how most referee's approach it. Numbers on front, color tape, whether a game ball has NFHS logo on it or not; all of these rules are ecstatic OHSAA policies. But when you have 5 officials, 2 whose primary job is to verify subs and the team has a history of substitution issues, something might be up. My issue is the state has no appeal policy, which is ridiculous!! The time and effort that the players and coaches put in for a season and there is no policy for appeal on tournament matches!! SO OHSAA, says as long as it does not look like cheating, your okay, because the policy states there is no appeal, final score is that FINAL. The error was clearly on the refs. I am sure they were just as upset about it then as you are now (still). I am sure substitutions will be watched closer next season as a result.